Is the ecarin clotting time (ECT) a valid monitoring parameter for r-hirudin-based anticoagulation in continuous renal replacement therapy? For continuous renal replacement therapy, systemic anticoagulation is required. Besides heparin, the current anticoagulant of choice, the direct acting thrombin-inhibitor r-hirudin was reported to be of advantage in chronic intermittent haemodialysis due to reduced filter clotting. The ecarin clotting time (ECT) was suggested to be a valid monitoring parameter with a linear correlation to r-hirudin concentrations in plasma . To our knowledge, no results of hirudin-based anticoagulation during continuous renal replacement therapy in intensive care have been published yet. The objective of our study was to evaluate whether the ECT correlated to r-hirudin concentrations in plasma in this setting. Seven patients on continuous veno-venous haemofiltration, due to acute renal failure, were included in this prospective study. Anticoagulation was titrated to achieve ECT-values between 80-100 s and parameters (ECT, PT, aPTT, TT, Fibrinogen, AT III, platelet count, ACT) were monitored by four-hourly determinations. R-hirudin concentrations in plasma were measured 24 and 48 h after starting therapy. Statistical analysis was performed by Spearman correlation. 5 of 14 measurements of hirudin-concentrations in plasma were found to be below the cutoff point of the r-hirudin test (<0.1 µg/ml). Six measurements were between 0.1 and 0.2 µg/ml and three results >0.3 µg/ml. For all measurements of our study we found a weak but statistically significant correlation between ECT and r-hirudin levels (r=0.52; P=0.048). Within the narrow range of r-hirudin levels between 0.1 and 0.2 µg/ml, applying to 11 of 14 test results, a broad range of ECT values between 60 and 105 s. were found. 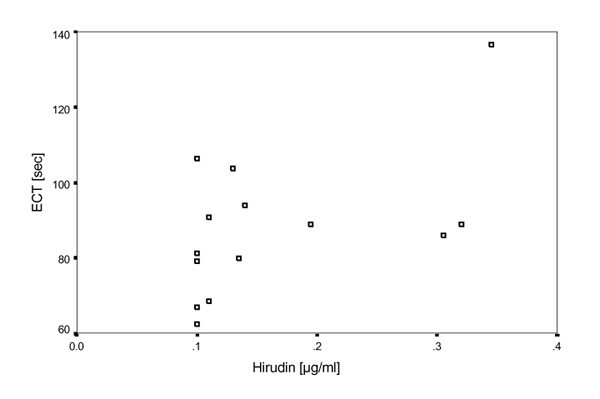 During CRRT very low plasma levels of r-hirudin ranging from <0.1-0.35 µg/ml were observed. For low plasma r-hirudin concentrations up to 0.2 µg/ml, including the majority of the investigated patients, the ECT may not be reliable for guiding anticoagulation during CRRT. It is not clear whether this is related to methodological problems due to laboratory determinations or to interference with pathological conditions of other coagulation disorders. However, a more valid monitoring for r-hirudin based anticoagulation in continuous renal replacement therapy is required.